Consistent linking and accurate synchronization of multimedia elements in hypervideos or multimedia documents are essential to provide a good quality of experience to viewers. Temporal models are needed to define relationships and constraints between multimedia elements and create an appealing presentation. However, no commonly used description language for temporal models exists. This makes existing temporal models harder to understand, compare, and transform from one to another temporal model. Using a formal description ismore accurate than commonly used textual descriptions or figures of temporal models. 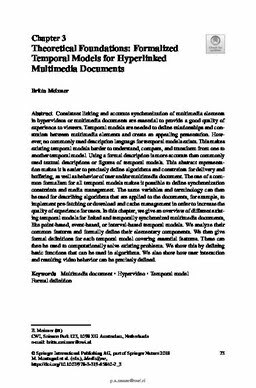 This abstract representation makes it is easier to precisely define algorithms and constraints for delivery and buffering, aswell as behavior of user and/or multimedia document. The use of a common formalism for all temporal models makes it possible to define synchronization constraints and media management. The same variables and terminology can then be used for describing algorithms that are applied to the documents, for example, to implement pre-fetching or download and cache management in order to increase the quality of experience for users. In this chapter, we give an overview of different existing temporal models for linked and temporally synchronized multimedia documents, like point-based, event-based, or interval-based temporal models. We analyze their common features and formally define their elementary components. We then give formal definitions for each temporal model covering essential features. These can then be used to computationally solve existing problems. We show this by defining basic functions that can be used in algorithms. We also show how user interaction and resulting video behavior can be precisely defined.